Does duct tape (or duck tape) help your writing? 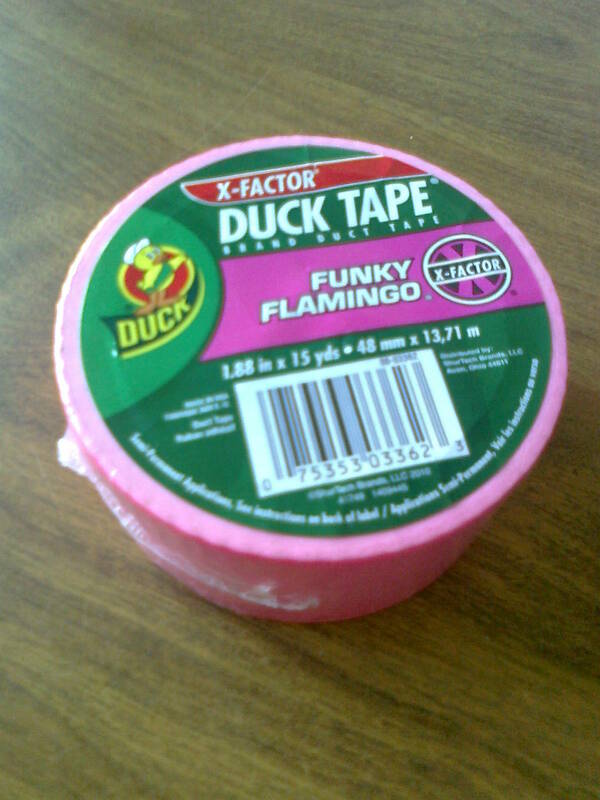 Often I have heard it called “duck tape”, which makes me laugh. Apparently it has been called one or the other since the 1940’s, and was useful as duck tape to WWII soldiers. 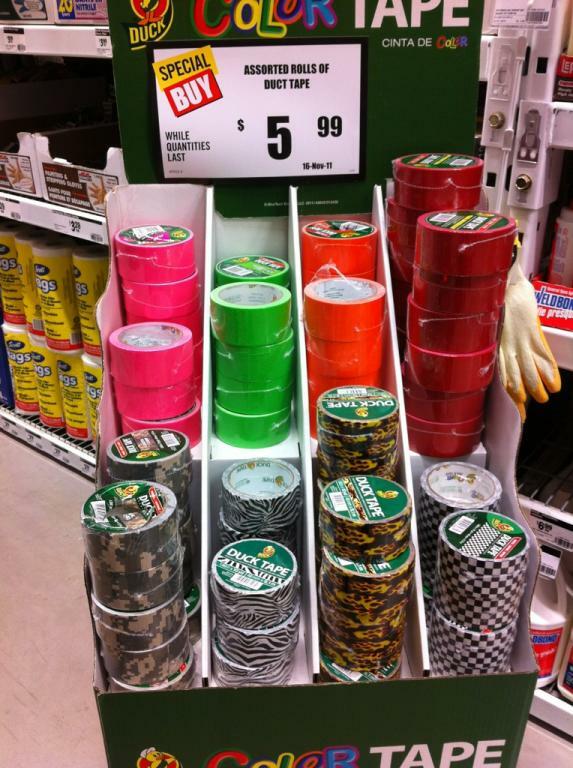 I have been saying for some time now that I have to find some duct tape in a colour other than the usual grey, and I want pink. Just because I like pink. Oh … my! A whole display. And look at all the colours and patterns! She likes the zebra one — second one in on the bottom left. The company picked up on the other name and marketed it. Duck tape duct tape. How clever! And the pink is called Funky Flamingo. Hilarious! Have you ever been writing along and suddenly you are on what seems a totally wrong path for your story? Perhaps your character starts acting out in a way you didn’t plan, or the plot takes an unexpected turn. Instead of trying to pull it all back to what you first had in mind, try going with it, ‘market it.’ Maybe that duct tape you thought you had turns out to be a roll of duck tape. Doubly good. Underneath it is the same, but on the surface you are about to go on a wonderful adventure that will be even more meaningful when pieced together. Have you ever started out with one idea and ended up with something entirely different? Or with added twists that make your story even better? Remember, duct tape … or duck tape … is used to hold things together, and to repair things, and to create new things. Have you used any lately, figuratively or for real? What difference did it make? This entry was posted in Preambles to Writing and tagged Canada, duck tape, duct tape, story ideas, The Red Green Show, unexpected plot changes, World War II, Writing. Bookmark the permalink. Duck tape would help my writing improve if I wrapped my children up with it and put a piece over their mouths. Then I could concentrate all day long and have peace and serenity. Just kidding. 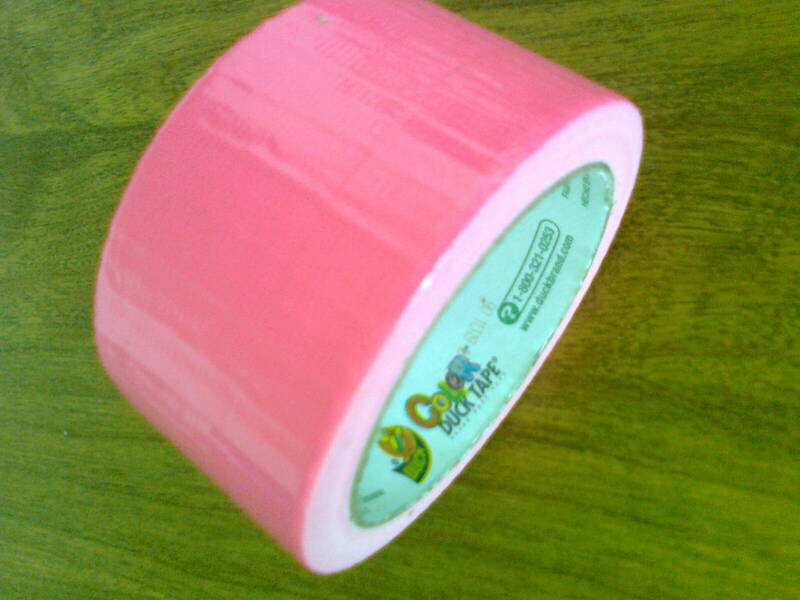 Since duct/duck tape can be used for crafting, maybe giving them a few rolls of it to make fun stuff would give you some writing time. There are websites that have ideas for that. Thanks for your fun comment. Yes! 🙂 I enjoyed that movie, funny. If you can find The Red Green Show on TV where you live you might find it amusing. I really want a duck tape roll (Not gray). You are lucky (even if I don’t really like pink)! 😉 I like how you compare it to writing! My husband and I loved watching The Red Green Show and we have often used duct tape to fix odd things, Oh yes, my stories often go off in a different direction but my imaginary duct tape ties it all together. I LOVE the coloured duck tape. So cool!! It’s fun to read about how stories change and develop. I often wonder about the ‘what if’s’, how stories, and lives, would be so different with just one thing happening a different way. I enjoy making things out of duct tape! Sadly there isn’t much design/colour/choice available in my country. I wish there were more! Hi Cheryl. Duct tape is great, isn’t it? I suppose shipping would be too costly to order it online. Thanks for visiting my blog – all the way from Singapore. Red Green is one of my favourite shows, and one of the only ones I’ll stop and watch these days, because I don’t watch television. Back in the 70s or 80s, Red was Steve Smith, the other half of Smith and Smith, a half hour stand-up comedian show he had with his wife. My last child was born through C-section and the following day I was watching Red Green and sadly had to turn it off. I couldn’t stop laughing, and every laugh produced excrutiating pain. As for stories going their own way…yes, my often can. Do I use duct tape? Yup, there’s always a roll in the house. Yes, I was remembering Smith and Smith as I was writing this post. Ohhh, ouch! I’m sure Red Green and C-sections would not go well together; even duct tape wouldn’t be of help there.